If you have ever gotten lost in the jargon of Wall Street, you aren’t alone. Professional money managers and traders often sound like they’re speaking a foreign language, which can leave small investors at a disadvantage. Unfortunately, jargon is likely to be here to stay, just as it is in sectors outside the financial world. Whether you’re just flirting with investing or head-over-heels for the stock market, you’ll eventually hear some phrases that give you pause. The language used by Wall Street professionals can make reading financial news difficult to understand for those outside the business, and can certainly be intimidating for an irregular observer, that is unfamiliar with the ways of Wall Street. Understanding what they’re actually saying will help you make smarter investing decisions. With that in mind, here’s a primer on the A to Z of the Wall Street universe. 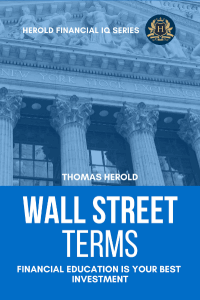 This practical glossary of Wall Street terms covers everything from investment fundamentals to the sophisticated terminology of contemporary finance. Over 140 of the most important and common terms are explained in detail, with clear and concise article style description and practical examples. Wall Street stock market jargon has the potential to be confusing, which leads to apathy, which leads to you not paying enough attention to the markets and your money. Taking time to understand the Wall Street vocabulary can help you with your financial planning, eliminating confusion, and get you better prepared for any swift and smooth financial transaction.